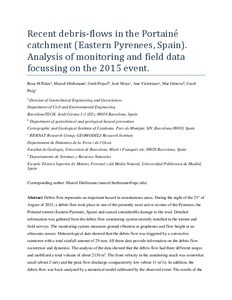 Palau, R., Hurlimann, M., Pinyol, J., Moya, J., Victoriano, A., Genova, M., Puig-Polo, C. Recent debris flows in the Portainé catchment (Eastern Pyrenees, Spain): analysis of monitoring and field data focussing on the 2015 event. "Landslides", 22 Abril 2017, vol. 14, núm. 3, p. 1161-1170.